Nakanoshima Park is a waterfront park nestled between Dojimagawa and Tosaborigawa rivers. Spread across an area of 10.6 ha, the park is an urban oasis. It was established in the year 1891 and was Osaka’s first public park. At the end of every year, the park is illuminated beautifully and attracts a lot of visitors. It has a rose garden which is home to around 4000 rose bushes of approximately 100 rose species. The park has been designated as one of the 100 most scenic greenery spots in Osaka. Entrance fees may apply during special rose exhibitions. Cafe present within park boundaries. How popular is Nakanoshima Park? People normally club together Sumiyoshi Taisha Shrine and Minami while planning their visit to Nakanoshima Park. I visited during the winter months and although I wasn’t expecting to see many large flowers, I did in fact see several spread out across a beautifully hard landscaped island. It’s particularly well done with the flower beds labelled with the approximate decade the flowers were developed. Walking eastward the gardens continue under a short tunnel and over a bridge into the park (which is primarily just lawn, trees, and modern sculpture). The rose garden itself is very peaceful with several items of furniture on which to seat yourself and temporarily rest. Really a beautiful garden indeed. I love coming to this garden during October when the roses are in full bloom. There are a variety of riverside terraces available as well as pop up tents with things to taste and drink. The island itself provides a respite from the rest of the city as the rose garden area of the island is wide open and provides wide open views of the city buildings. The garden is particularly nice during golden hour when the sun reflects off of the buildings. I like that there are tables available outside of the riverside terraces that allow you to take out and enjoy your food while watching people gawk at the roses. The giant floating duck has docked itself right off of this side of the island in the past and there are numerous events such as yoga and small outdoor markets that occur here as well. I went when they had Christmas decorations. It was quite big place but I couldn’t see much flowers... but it will be good if they have invent might be good to go. But I’m not pretty sure if it’s good if it is empty place probably there are nothing to see. It's a good place for pit stop if you are visiting the area. It's located in the bank of a river so the atmosphere is very good. The roses just make it perfect. 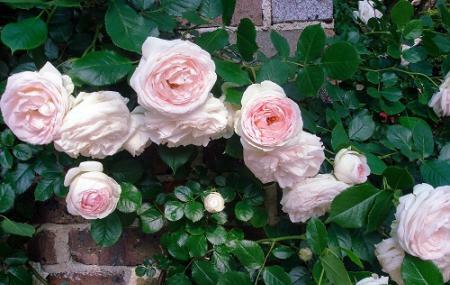 There are lots of different breeds of roses. All are beautiful not to mention. It is also a good place to visit by family and have a picnic.